You are currently browsing the tag archive for the ‘Victoria Day’ tag. This weekend is the unofficial start of summer. Mother Nature even seems to be willing to cooperate, as the forecast is calling for sun and temperatures in the low 20s all weekend long. As it is Victoria Day on Monday, that means for the first long weekend of the summer! I for one can’t wait. So get ready to have a great weekend, as there is plenty to do in London, Ontario this weekend. Grab your bathing suits (and swimmers for babies – no diapers cloth or disposable diapers allowed) and get ready to get wet! Note that there is no standing water, as the splash pads are all sensor activated. There is also no supervision at any of the sites. The splash pad at Storybook Gardens will also officially open this weekend. For the remainder of May, hours are Monday to Friday from 10 am – 4 pm and weekends 10 am – 5 pm (including holiday Monday on the 20th). Prices for the 2013 year are Adults $7.50, Children (2-17) $6.50, Families (2 adults & 2 children) $25, Seniors (65+) $6.50, Infants (under 2 years) free. If you know that you’ll be heading there often enough, you might even want to consider purchasing a seasons pass for $35. It is good for one full year from date of purchase, so that you can enjoy the park in winter or summer. Plus it enables you to get 10% off any purchases in the Treasure Chest Gift Shop, at the Village Square Cafe concession stand, and for select programs. It just wouldn’t be a long weekend without fireworks! If you are looking for sparkling skies and a big bang or two, head out to Fanshawe Conservation Area on Monday, May 20th. 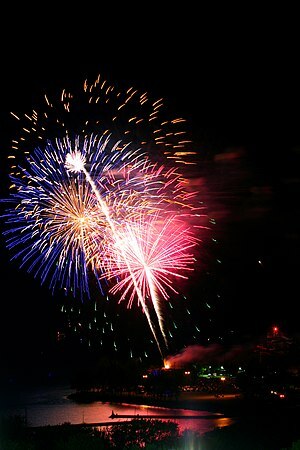 Fireworks displays begin at dusk, but there is plenty more to do there before then. There are 20 km of trails for hiking and biking, plus 8.5 km dedicated exclusively to hikers. You can go fishing or boating on Fanshawe Lake. Or bring along a tent or trailer and enjoy the park all weekend for a camping trip (note there is an alcohol ban in place for the May long weekend). While you are there you can also head over to Fanshawe Pioneer Village, as it officially re-opens for their 54th season on Saturday May 18th. They will be stepping back in time on May 20th to celebrate her majesty Queen Victoria herself with historical games, speeches and a vintage baseball game. Entrance to the Pioneer Village is $7 with children under 3 free. To get into Fanshawe Conservation Area, you just need to pay $12 for a vehicle day pass. Happy Victoria Day Weekend Canada! Did your plants survive the frost last night? Pretty chilly in London, Ontario, let me tell you. Can you believe that it is May and we have had snow, sleet and a whole dollop of winter this week? Well, this coming weekend is the Victoria Day weekend in Canada. Traditionally it has always been the harbinger of summer. Hopefully this long weekend will measure up! Not only is Victoria Day touted as the beginning of summer, it is also the unofficial start of gardening season. So even if you lost a tender plant or two last night, you should be able to replace and plant pretty much anything now. Bring on the flowers, vegetables, annuals, perennials and whatever else you’ve got planned to go into your plot of dirt. A family run business since 1955, this garden centre and nursery has received the Better Business Bureau’s Business Integrity Award, as well as Landscape Ontario Consumer’s Choice Award. The 110 acre growing facility is home to a plethora of fresh and healthy shrubs, trees, perennials, roses, vines, annuals, vegetables, herbs, houseplants as well as gardening supplies and decor items. They even have a kid’s activity centre where children can do gardening crafts while you shop. Another family run nursery, Heeman’s has been around since 1963. Strawberries is where the business started and it has flourished from there. With over 50 acres dedicated to strawberries, featuring a pick-your-own that is constantly in demand, the 190,000 square feet of greenhouses featuring 900 varieties of annuals, 500 varieties of perennials, 80 varieties of vegetable plants and 30 varieties of herbs are also a big draw. They even offer winter storage, custom ordering (to create personalized containers that shine), plant rentals (for weddings or other special functions) and regular updates on their social networking sites (Facebook & Twitter). Started as The Little Tree Farm, the Springbank Garden Centre has seen plenty of changes since the early 1960s when they first opened their doors. The garden centre has seen changes in owners, in property size (City of London expropriated 30 ft strip for widening Springbank Dr in 2003) and more recently a change in location when they moved to a newer, more modern building 200 ft west of the original site. They hasn’t changed the heart of what they offer though. You will of course find a wide variety of annuals, perennials, herbs, vegetables, hanging baskets, trees, shrubs, house plants, soil, mulch, garden stone, tools, decor items, lawn needs, fertilizer, firewood and more. The staff are always friendly, as well as being extremely knowledgeable about everything that they carry. Located in the heart of London, it is easy to get to from pretty much anywhere. Why not stop in and see what they have today? Are you looking for something new or unusual? Van Horik’s is the place for you! This family run business has been around since 1969 and they have a pulse on the gardening world. In fact, Denise Hodgins writes a weekly column in the Homes section of the London Free Press, discussing the latest news and views from the garden industry, not to mention their regularly updated Facebook page. There is more to Van Horik’s than that though. You will find a wide selection of annuals, perennials, trees, shrubs, pond plants, tropicals and even seed packets for those wanting to grow their own plants, at the garden centre. Other garden essentials like soil, mulch, fertilizer, landscape stone, lawn care items, tools, containers, and decor items can also be found there. 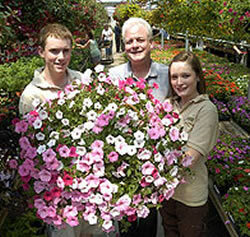 The Van Luyk family opened the doors on their greenhouse in 1970 and have been going strong since then. Now boasting over 50,000 square feet of greenhouses, where 80% of the plants that are sold come from, they sell annuals, perennials, bulbs, trees, shrubs, vines, hanging baskets, mulch, soil, landscape ornaments, garden tools and more. They are open seven days a week, year round, featuring tropicals, pumpkins, straw, Christmas trees, poinsettia, lawn care and whatever else you might need for your garden, regardless of the season. If you can’t find it, then ask! The employees are resourceful, dedicated and one of the joys of visiting Van Luyk’s. What is your favourite garden centre, nursery or greenhouse in London? What will you be planting this weekend? This weekend we roll into the first long weekend of summer by celebrating Victoria Day on Monday. Canadians itch for the feel of sunshine on their faces after a long winter and this weekend is shaping up to offer lots of it, according to the Weather Network. I for one hope the weather man is correct this weekend, as many of the local seasonal attractions will be opening their doors for the start of summer fun. I know many of you will be headed out-of-town to open cottages, trailers or looking forward to the first camping trip of the season, but if you are sticking around London, here are a few options of where to go for summer fun this Victoria Day weekend. Race into summer this weekend with a trip to East Park! You know summer has arrived, when the Go-Karts hit full speed ahead in the east end of London. That’s right, this weekend you can hit the driving range, play a round of golf or mini golf, practice your swing in the batting cages, and of course enjoy everything that the indoor attractions have to offer in the INTENCITY, after spinning around the Go-Kart track. Unless you can convince the powers that be to open up the waterpark, you will have to wait until May 26th, but there is still plenty to keep you busy in the interim. FYI; a season’s pass will get you access to the park anytime you want all summer long. Just saying! As of May 19th, Fanshawe Pioneer Village will also open its doors for their 53rd season. You can wander through the village on a self-guided tour, through an example of rural living in this area from about 1820-1920. You can peek through the schoolhouse or church, watch people dressed in period costume tend the garden or work at the sawmill, or even stop into the general store or cafe to purchase handmade treats, gifts or snacks. On Monday, May 21st celebrate her royal majesty the Queen the old-fashioned way. There will be historical games, speeches and a vintage game of baseball all in celebration of Queen Victoria’s birthday. The park itself may not close during the off-season, but certain sections of it does. With all the sunshine that is forecasted for this weekend, the re-opening of the splash pad will be a welcome thing to area children and parents alike. Along with the splash pad, the ferris wheel will begin spinning again on May 19th for another season. The train, carousel, swings, elephant ride and super slide are all open for fun in the sun as well. Don’t forget to check out Pirate Island, Old McDonald’s Farm and the maze. If you go, make sure that you stop by to say goodbye to the harbour seals too, as their last weekend at the park is May 26-27, before being relocated to the St Louis Zoo. If you are looking for something a little different this weekend, how does Canada’s favourite pastime of hockey sound? On May 19-20, 2012, all across Canada there will be a street hockey tournament to beat all games. And right here in London, Ontario, players will be grabbing their sticks for London’s 6th annual weekend hockey game. This year, Victoria Park will host Canada’s largest Sports Festival, with divisions for all ages, genders and skill levels. If London’s own hockey league, the London Knights, will be there, maybe you should be too! See you there! This is what we have all been waiting for my fellow Canadians. The days are counting down to the first official weekend of summer. As of 5 o’clock on Friday, May 18th, 2012 Victoria Day weekend begins. I know that vehicles will be packed and ready to head out-of-town for camping and to cottages and trailers both near and far. For those that aren’t headed out-of-town though, there is still lots to look forward to. I wouldn’t be surprised if a pool or two gets opened between now and then, plus I bet garden stores will be jammed with folks looking to pick up tomatoes, cukes and more to safely plant their annual veggie gardens. Hello Summertime! Planters aren’t just for flowers anymore. Tomatoes will happily grow in large planters, as will a basil plant to compliment it. Pretty much any herbs lend themselves well to container gardening and you can even design your container herb garden with a purpose in mind (ie. Italian pot of basil, parsley, sage & thyme or a tea pot of chamomile, mint or lavender). Peppers also take well to container planting, as do radishes and most lettuce varieties. If you choose specific varieties of plants, like bush-style squash or cucumber, you can avoid long vines to contend with, although pole beans are quite happy snaking up trellis of some sort. Plastic lawn chairs will work in a pinch, but there is so much more available nowadays in outdoor seating choices that why would you ever bother with them? Think benches, swings, chaise lounges, outdoor sofas and loveseats, plus a wide variety of stylish chairs and ottomans that are now on the market. You might not want to traipse your fine china out into the back yard every time you want to dine al fresco, so think about purchasing some sturdy, yet attractive dinnerware to dine off of this year.